These days, it seems people have gotten really creative with their beer drinking. The Go Plate, much like The Ashhole, (which MSLK designed the packaging for) can transform your empty beer bottle, can or cup into an instant commodity. 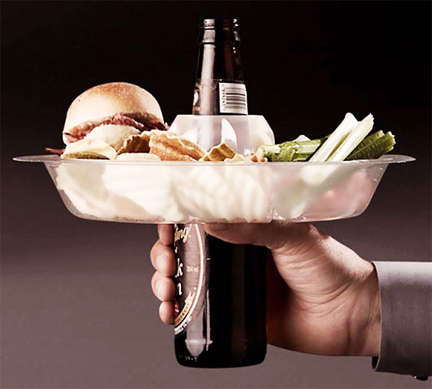 While The Ashhole fits on top of empty bottles and converts them into an ashtray, The Go Plate fits around your beverage receptacle of choice and as a result, allows you to carry your food and drink in one hand. It’s pretty clever and pretty practical; however, I don’t suppose it will help get rid of any beer bellies any time soon. As Reactions continues to evolve, we are pleased to announce the addition of guest bloggers to our blog. This post features Mariana Gorn, our trend-spotting, beer-swilling, intern.